Since middle school, Michael Zirkel has dreamed of going to law school and becoming an attorney. As he grew up, this dream began to tread auspiciously close to reality. Prior to realizing his dream, however, another more immediate opportunity presented itself to him: Bonner Program Coordinator at Stetson University. He took this opportunity and now uses that experience as a way to continually look forward and forge new pathways. Michael attended Stetson University, where he earned a Bachelor of Arts in Social Sciences. Through this interdisciplinary course of study, Michael was able to examine a variety of human experiences from a plurality of academic viewpoints. He was especially interested in investigating the experiences of homeless communities. During his undergraduate career, Michael worked at The Neighborhood Center, a resource center that provides support to the local homeless community in DeLand, FL. Michael worked on a broad range of capacity-building projects to increase the productivity of the center, including working alongside licensed social workers to develop exercises to help clients navigate and access all of the resources available to them. Though homelessness was an area of academic interest, Michael’s true passion was always in law. His post-graduate goals were to attend Stetson Law School and practice trial advocacy. On the cusp of achieving these goals, however, Michael decided to forgo his law school dreams. Nearing graduation, Michael learned that the Bonner Coordinator at Stetson University was not renewing their AmeriCorps VISTA contract for the next year. As the Bonner Senior Intern at the time, Michael was encouraged to apply to be the new full-time Bonner Coordinator. He did, was hired, and then went on to start in the position during the summer of 2013. For a little over a year, Michael oversaw the Bonner Program at Stetson University. While serving in this role, he cultivated an interest in program development and student support. 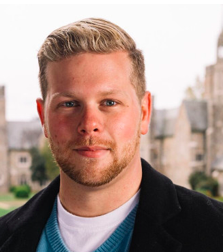 He actively sought ways to remain connected to the Bonner Network and decided to apply to the new Bonner Coordinator position at Berry College. He was offered the position and then moved north to settle in Rome, GA. In this position, Michael says that the best part of his job are the students. “It starts at recruitment day when you get to meet new students and hear their stories,” said Michael. He loves to hear how all of the students, whether or not they become a Bonner Scholar, have carved out their own spaces for themselves in the world. Even though he enjoys coordinating the Bonner Scholars Program at Berry College, Michael does not see this as his final dream job. He plans to continue his education by obtaining a Masters of Business Administration at Berry College and seeing where that leads. His advice to younger Bonner Scholars and Leaders is to always be open to opportunities that you may or may not like; it may just alter your professional path and aspirations.